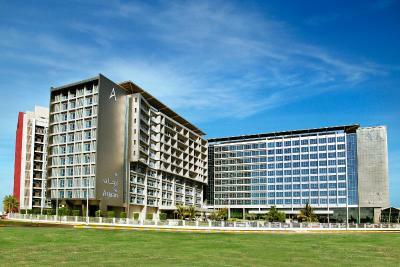 Lock in a great price for Park Rotana Abu Dhabi – rated 8.8 by recent guests! Staff warm, facilities good, food good and I recommend it for passing passengers. 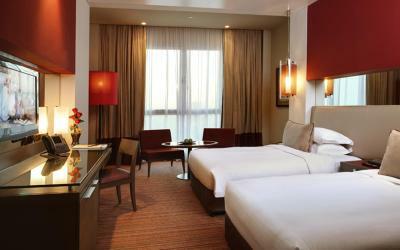 I love this hotel and recommend it to friends visiting Abu Dhabi. 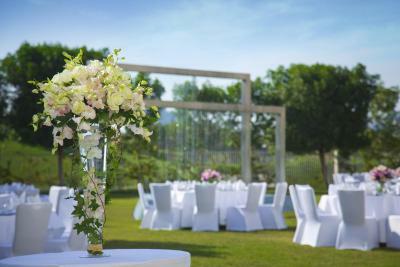 The management and staff truly work hard to earn your business and to make guests feel welcome. 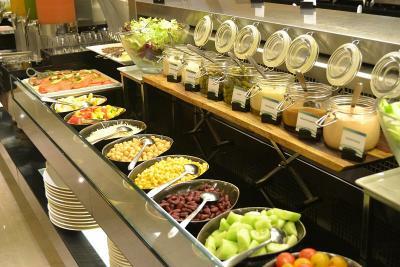 The facilities are spotless, and the food is delicious. 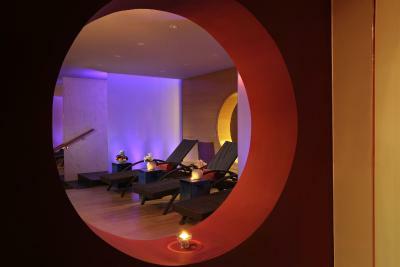 Oh, and the spa is not to be missed! It’s amazing place to stay in. The facilities are nice. The staff are very helpful. 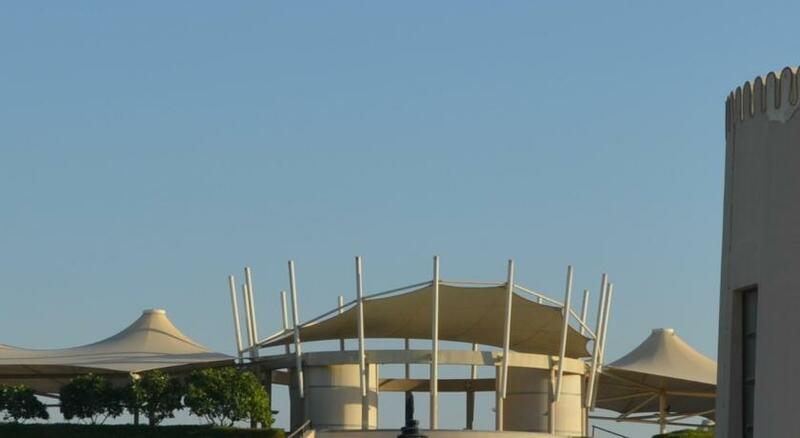 Value for money and location proximity to tourist attractions at Abu Dhabi including the Grand Mosque. 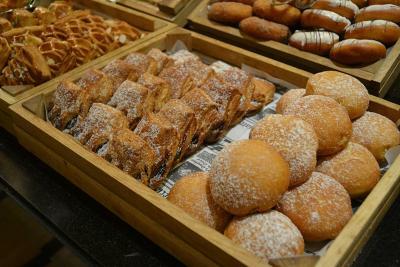 Hospitable staff and room amenities. 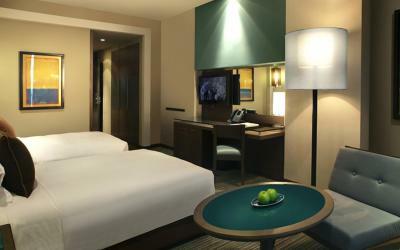 Staffs are very accommodating and the room is very clean. 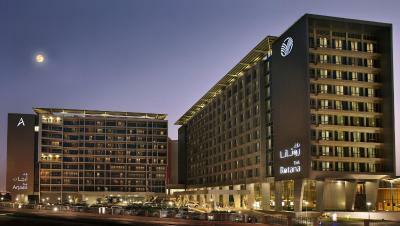 Park Rotana Abu Dhabi This rating is a reflection of how the property compares to the industry standard when it comes to price, facilities and services available. It's based on a self-evaluation by the property. Use this rating to help choose your stay! Located five minutes away from the Sheikh Zayed Grand Mosque, Zayed Sports City, Wahat Al Karama Memorial Park and the Abu Dhabi National Exhibition Center, Park Rotana features free WiFi, five food & beverage venues and a host of recreational facilities at the bodylines fitness & wellness club. 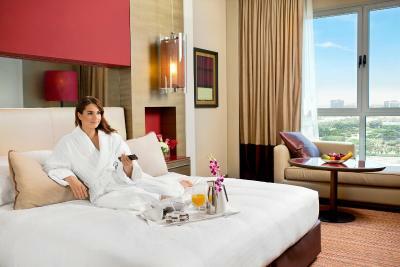 The vibrant and modern property offers 318 spacious rooms and suites designed in a contemporary style, many overlooking the Sheikh Zayed Bridge or Khalifa Park. 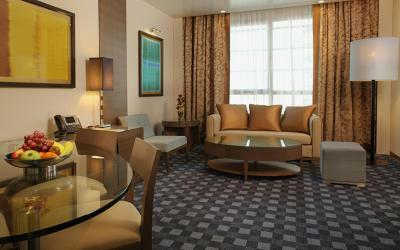 Club rooms and suites also include access to an exclusive Club lounge located on the 9th floor. 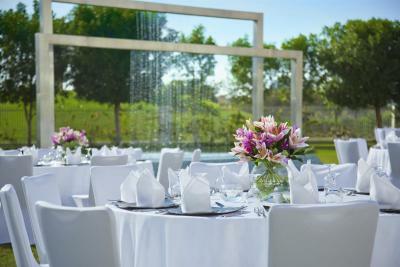 Guests can choose from a wide variety of Continental, Asian and Arab cuisines in the hotel’s restaurants while beverages can be enjoyed at the pub, specialty restaurant and pool bar. Fitness and wellness facilities include an outdoor temperature-controlled swimming pool, sheltered children’s pool, play area, floodlit tennis court, steam room and sauna. The Hotel is located 30 minutes away from the Abu Dhabi International Airport and Yas Island can be reached with a 20 minute drive proving a great choice for leisure and business travelers alike. 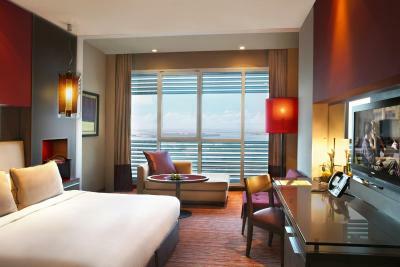 When would you like to stay at Park Rotana Abu Dhabi? 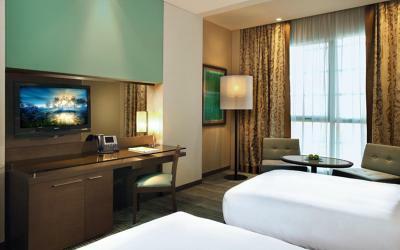 Facing Sheikh Zayed Bridge, this room has a walk-in shower, mini-bar, tea/coffee facilities, 32 inch LCD TV, high speed wireless internet access, 3IP phones, hair dryer and an in-room safe. 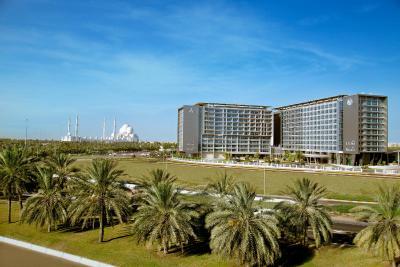 Featuring views of Khalifa Park, this air-conditioned room has Wi-Fi, a 32-inch flat-screen TV and a large walk-in shower. 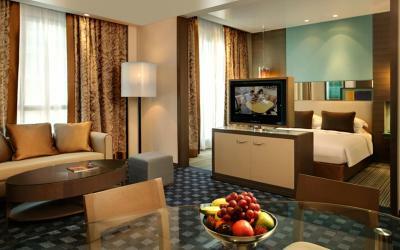 It features a hairdryer, minibar and tea and coffee-making facilities. Facing either Sheikh Zayed Bridge or Khalifa Park, this room has a large walk-in shower, minibar, tea and coffee-making facilities. All rooms come with multi satellite 32 inch LCD TV, high speed wireless internet access, 2 IP phones in the bedroom and one in the bathroom. 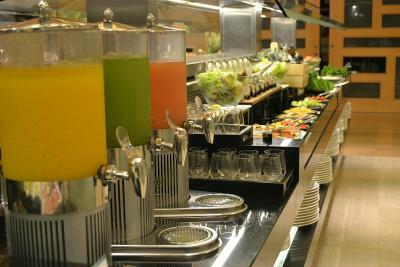 It has complimentary access to the Club Lounge, buffet breakfast and free internet in club lounge. 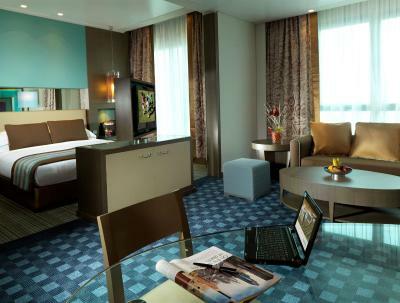 This suite has a partitioned bedroom in living area and faces either Sheikh Zayed Bridge or Khalifa Park. 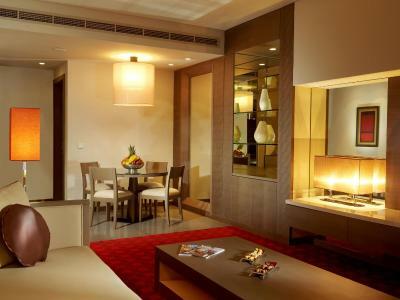 Each Suite has a large walk-in shower, minibar, tea and coffee-making facilities. All rooms come with multi-satellite 40 inch LCD TV, high speed wireless internet access, 2 IP phones in the bedroom , Club Lounge Access, buffet breakfast and Internet access in Lounge is complimentary. 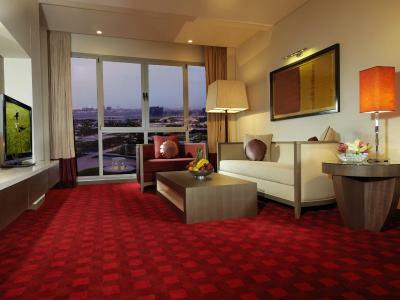 This suite comes with a separate living room and bedroom and faces either Sheikh Zayed Bridge or Khalifa Park. 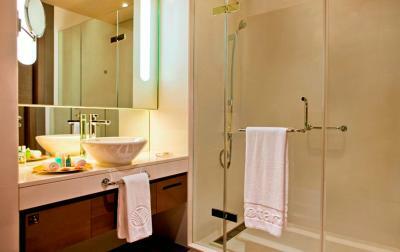 Each Suite has a main bathroom with walk-in shower and a guest bathroom. 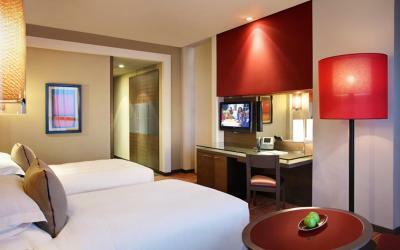 All rooms are equipped with 2 multi satellite LCD TV in the bedroom and in the living room, high speed wireless internet access. 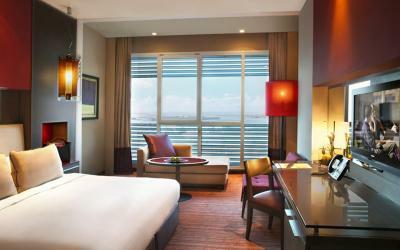 With this room you get complimentary access to the Club Lounge, buffet breakfast, and free internet access in club lounge. This family room features a mini-bar, seating area and bathrobe. 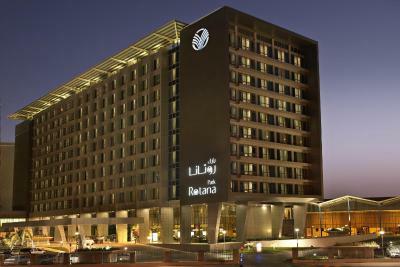 Park Rotana represents the brand Rotana Hotels & Resorts, and is present in Abu Dhabi since 2010. 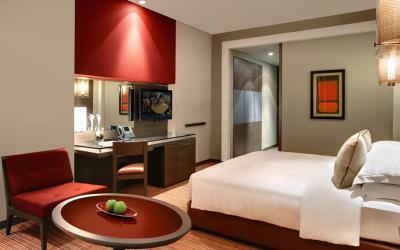 We have a total of 490 rooms, where 318 belong to the hotel and 172 are furnished apartments. 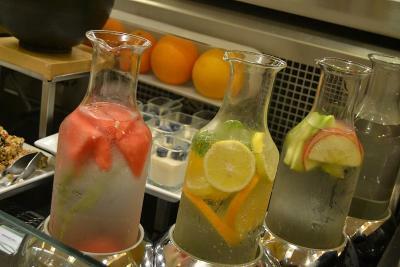 We commit ourselves to bring you the best hotel experience in the region, where you feel you're at home. Treasured Time, is our promise to you. 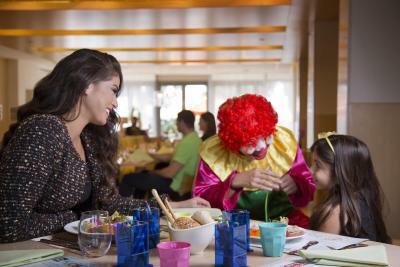 House Rules Park Rotana Abu Dhabi takes special requests – add in the next step! 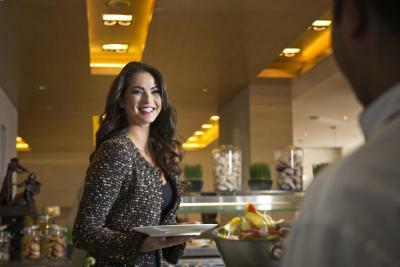 Park Rotana Abu Dhabi accepts these cards and reserves the right to temporarily hold an amount prior to arrival. The staff were absolutely fantastic!!! 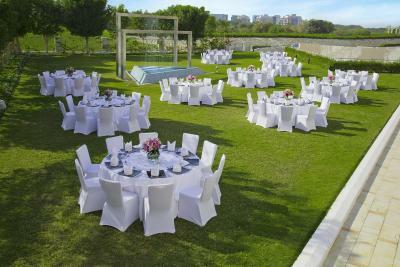 The property was very clean and luxurious. Behaviour of the Ginger restaurant incharge was very rude to say the least. The restaurant manager (Indian guy with suit) during breakfast told us not to sit at a certain area of the restaurant and moved us to a different table after we sat, then 5 minutes later he let other people to sit there and weren’t removed which is absurd and quite unfair. Also, breakfast closes at 10:30, and by 10:15 he told us in an uninviting manner that we should finish our food in 5 minutes. I was very disturbed but a waitress came and told us politely that if we may require anything and that kitchen closes at 10:30. Park Rotana is my go-to hotel when I’m in Abu Dhabi, but I might reconsider due to this bad experience during breakfast with that specific individual. The location and room service. It was confortable and friendly deeling with. The pool is small and it is meant for all compound, all buildings in the location with no facilities. 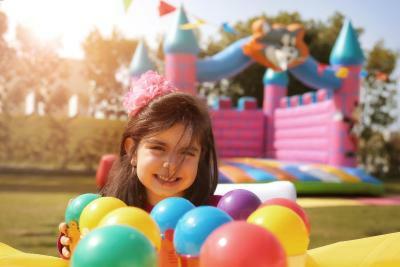 The kids area is small and nothing but some playground that it is not interesting at all. Pool bar service was not up to it’s usual standards. Excellent service from very polite staff. After a minor misunderstanding with a staff member at booking, the management and staff went above and beyond to clear the misunderstanding and to make my stay extra special. They genuinely cared about my comfort and that of my party, and I greatly appreciate all of their efforts. Need to invest more on facilities. nothing to dislike, all was perfect. The staff at the ception are the best, super friendly and very welcoming. Rooms are big and clean, breakfast was good as well. 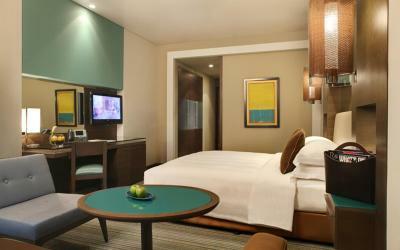 The quality of the rooms, professional staff especially the front desk and housekeeping. 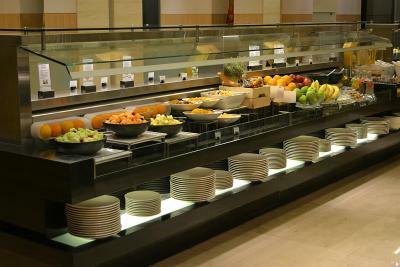 Breakfast was great with a wide selection of fruits, cereal and juices. I'm always treated like a VIP and family, a great hotel in Abu Dhabi. Deserves the 5 star rating!!! !